If you have a swimming pool in your back yard, you know the challenges of maintaining the deck that surrounds the pool. Concrete decks crack and look unkept, not to mention unlevel surfaces can cause slips and falls. Tile surrounds are often slippery, and wooden decks require extensive, regular maintenance to keep them looking their best. A pool deck coating from Prestige Floor Coating can help you solve all of these issues while still providing an attractive surface to highlight your home’s outdoor recreation area. We manufacture our pool deck floor coating products in-house, so we can create a product that fits your own unique needs and wants. Our products are VOC free, meaning our pool deck floor coatings will release no harmful chemicals into the environment. Contact us today to learn more call us at (443) 519-2628 to request an estimate! Our pool deck floor coatings can even withstand the harshest of Mid-Atlantic weather conditions. You can trust our product because we stand behind our floor coating system by offering warranties with all of our flooring installations. Using pool deck floor coatings help to reduce the time and money that you have to spend on deck maintenance. Our floor coating is impenetrable and seamless, so you don’t have to worry about debris getting into cracks or filling in gaps as you do with a concrete floor. Also, a pool deck with flooring from Prestige Floor Coating helps to keep your friends and family safe. The textured surface is less slippery than other deck surfaces and water runs right off of our coating material. Our pool deck floor coatings are also easy to clean, in fact, they can be cleaned with the hose. For more thorough cleanings, a simple bucket of warm soapy water and a mop are sufficient. 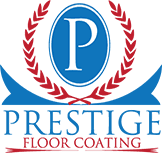 Prestige Floor Coating has been helping homeowners with their flooring needs for more than 16 years. Over that time, we have helped more than 40,000 customers and applied more than 30 million square feet of floor coating material. That experience tells in our professionalism and in our customer service. We have our own in-house chemists and patents to ensure that our products are the best on the market. To find out how Prestige Floor Coating can help with your pool deck floor coating, call us at (443) 519-2628 or request an estimate online today.